School’s out and vacation season is upon us. During the lazy days of summer or the fun filled days of vacation, you don’t want to be preoccupied with paying bills, going to the bank or worrying about money. That’s why we offer a number of options to make it easier for you to put your banking on cruise control while you journey through whatever the summer holds. If you’re traveling, remember that we have an excellent Fraud Department that looks out for potential fraud on your cards 24 hours a day. If you’re traveling with a debit card, be sure to use your PIN to avoid being flagged by our Fraud Department. Before you leave for vacation, contact us to make sure we have your cell phone on file. That way, if there is any trouble, we can reach you the instant it happens. If we only have your home number, we may not be able to reach you when you need your card the most. Using Online Bill Pay is a convenient way to schedule your bills to pay just once while you’re gone or even as a reoccurring payment. You choose how much to pay and when it will be delivered and we do the rest! This is a free service as long as you use it at least once a month. You can do a lot of your banking on the go with VCNB Mobile, our app which allows you to transfer funds between accounts, pay bills, check balances and even deposit a check using the camera on your device. Now you can even change your online banking password in the app rather than log in to a computer to do it. 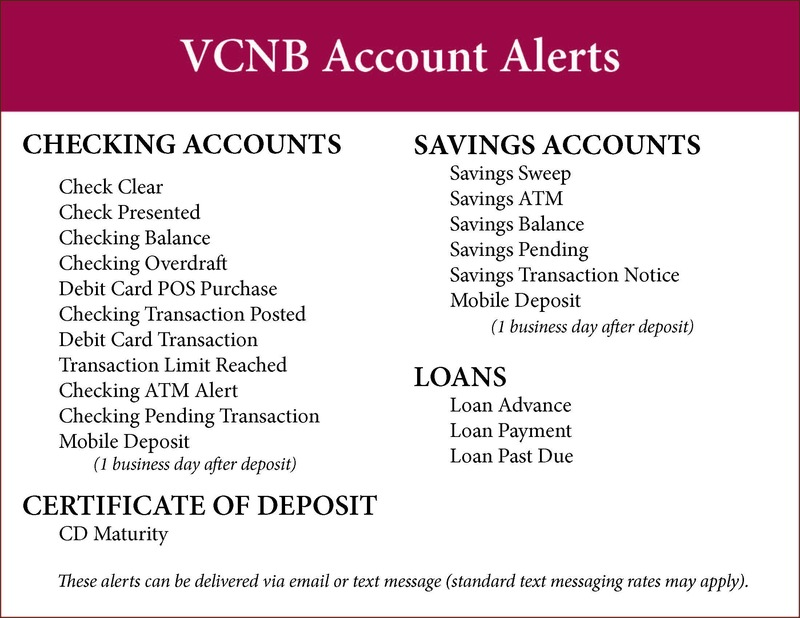 Account alerts are a terrific way to be reminded that you have a loan payment due, find out when a deposit hits your account or that your VCNB debit card has been used. A lot of our customers use this last account alert to know each and every time a debit hits their account so they can detect fraud early. We have about two dozen different kinds of account alerts and they are all free for our customers to use! One last thing – regardless of whether you’re traveling far away or just tooling around your hometown, be sure to always carry an alternate form of payment. Occasionally, you’ll find yourself in a place where plastic isn’t accepted or your card will be flagged for fraudulent activity and has to be turned off. We’ve known customers to fly across country only to have their card turned off because they were a victim of fraud. Always carry a second card or cash just in case you run into trouble. What are your summer banking tips? Comment below and tell us! Does your money ever keep you awake at night? Maybe you can’t remember if you paid a bill on time. Maybe you aren’t sure how much money you have in the bank or are worried you don’t have enough money for an emergency situation. There are lots of money related scenarios that can ruin a perfectly good night’s rest. Luckily VCNB offers a number of services that will help you rest easy, at least where your money is concerned. Thanks to technology like our website and mobile banking app, your accounts are accessible 24 hours a day from anywhere that you can use your computer, tablet or smart phone. Want to know if your payroll was deposited? Need to pay a bill or transfer funds from your checking to your savings? These are things you can easily do using our technology. Some of our customers say they are just too busy to keep their bills on track. They can afford to pay their bills, they just forget. Then they incur late fees and risk damage to their credit rating because of it. With Online Bill Pay, you can schedule your bills to pay one at a time, giving you complete control and knowledge of just what’s happening with your money. But if you’re one of those people who struggle in this area, you can also automate those bills to pay on time month after month. Just schedule it and rest assured the payment will occur when you want it to. Maybe you want to know what’s happening with your money but don’t have a smart phone or wish not to log in to your account regularly. You can have account alerts sent via text or email for up to nineteen different reasons. We can notify you when a loan payment is due, when a check clears or when your account dips below a certain balance. We can even notify you every time a debit card linked to your account is swiped at a cash register. You choose the notifications you want to receive and how you want to receive them. We do the rest! In this age where so many criminals are out to steal your money, it is difficult to know who you can trust. Identity theft is a major threat to consumers and even major retailers with respected names are at risk of a security breech. The fraud detection departments associated with our debit and credit cards are fantastic. They stay on top of national trends and potential threats to you, the individual customer. While we can’t guarantee you won’t be a victim of fraud, our card departments do everything they can to prevent it from happening to you when you use our cards. With our cards, we have 24-hour fraud monitoring so, while you sleep, someone is looking out for you. 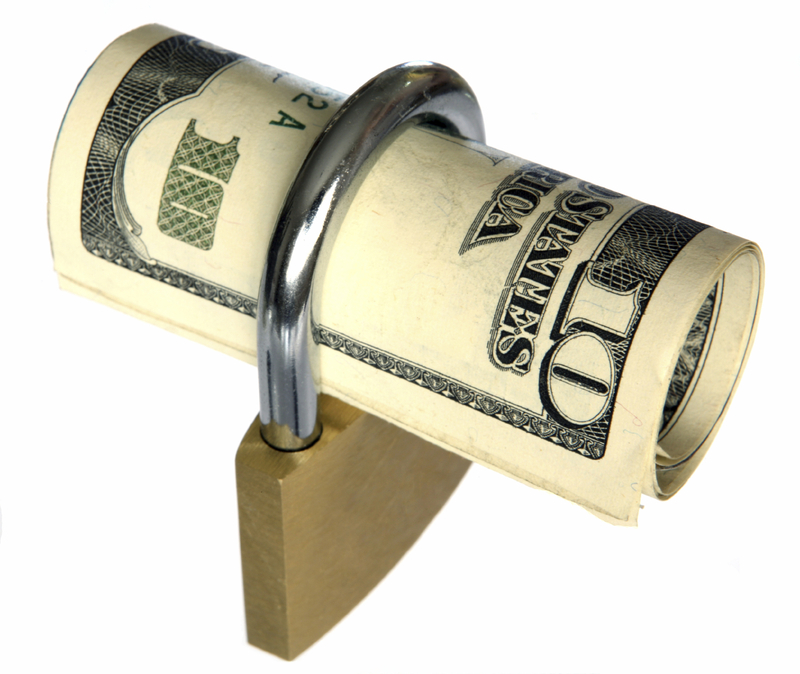 One main cause of money worries is the fear of emergency. Whether it’s something major like job loss or something small like a new set of tires, any unexpected emergency can be a threat to your financial well-being. We can help you consider the options for an emergency fund. Some customers have a savings account where they regularly deposit money for such events. We can help you open a savings account and even help you set up automatic transfers into your savings from another account. Some of our customers opt to rely on a credit card in emergencies. We can help with that too. Stop by your local branch and talk to one of our experienced accounts representatives about the money worries that keep you awake at night. We would love to help! Life is stressful and, if you’re like most people, money is a major contributor to life’s stress. Maybe there’s not enough money. Maybe the simple act of paying bills is stressful and time consuming. Maybe your strained relationship with money is causing a kind of disorganization that only makes your money relationship more stressful. At VCNB we strive to make your banking experience simple and less stressful. We have been thinking a lot about this lately because April is National Stress Awareness Month. We believe that being informed about your money is half the battle. That’s why we offer you so much access online and on your mobile device. Whether you are sitting at home or are just on a quick break from work, you can easily manage your money and get your questions answered. Managing your money doesn’t have to be stressful. VCNB offers services that make banking easy! What are some things you can do online and in our app? Check Balances – You can see at a glance the balances of all your accounts. Transfer Funds – Maybe your checking account balance is getting a little low. You can easily transfer funds from your savings. Or maybe you want to automatically save $20 a week. You can set up automatic transfers so that you never forget. Open Accounts – From checking and savings to an IRA or HSA, opening an account online is easy and can be done 24 hours a day. While we love when customers visit, we understand this is simply more convenient for a lot of folks. Popmoney® Personal Payment Service – If you owe someone money you can send funds from your account to theirs. All you need to know is their mobile phone number or email address. It does cost .50 per transaction but that is cheaper (and easier) than writing and mailing a check or hitting the ATM. View Rates – You’re thinking about opening a CD but you want to know the rate. You can find all this online now! Pay Bills – This is the big one for a lot of people. Once you enter the information for your payees, their information is stored. So when you go to Online Bill Pay, all you have to do is enter the amount of the bill and the date you wish the bill to be paid. Better yet, many customers appreciate automatic bill pay which ensures that your bills are paid on the same day every month. Bill Pay is free as long as you use it at least once a month. There is a $3 fee if you do not use it monthly. Online Chat – If you have questions but can’t visit an office or talk on the phone, online chat is a great option. Just find the chat button on our home page and type a question or comment. Someone will help you right away. Finally, remember that whether you bank online or in one of our seventeen offices, we have a terrific staff to help you along the way. Whether you call Customer Service, chat with someone from the website or stop by a branch, we want your experience to be pleasant and stress free. Would you like to keep up with your account activity without actually logging in to your account? If you sign up for Account Alerts you will be notified about any account activity that you consider important. These alerts can be delivered via email or text message (standard text messaging rates may apply). There are more than twenty different kinds of alerts available to suit your needs and best of all this service is offered for FREE through Online Banking. Account Alerts are available for Checking Accounts, Savings Accounts, Loans and your Certificate of Deposit. Signing up for Account Alerts can be done in just a few easy steps! Select Done, it’s that simple! What are you waiting for? Take advantage of this free service from VCNB today!